The Dynasty is back, long live the Dynasty! A month after Sonia plunged headlong into campaigning, the crowds thronging her rallies have only grown in number. Already, people are speaking of the Dynasty taking its rightful (whatever that may mean) place back in the Indian political firmament, of Rahul (yes, he too has reappeared) and Priyanka taking up important posts within the Congress party, and what have you. The appearance of the entire family -- Sonia, Rahul, and Priyanka along with and her husband, Robert Vadra -- at a rally in Amethi sent the crowds tizzy and the opposition to their conference rooms. Congress workers and leaders, at least for now, are confident of a role for Sonia (maybe even as PM) till such time that at least one of the children takes over. Yet, none have made any move yet, and till they do, it would be foolish to predict the outcome. While no one can deny the charisma of the Nehru-Gandhi family, and the tremendous psychological benefit that it bestows upon the family, what is amazing is how in a democratic institution one family has survived for so long. There certainly must be no parallel anywhere in the history of democratic countries. In an earlier column, I had mentioned how Indians are conditioned by their culture (casteism being an important facet) into accepting sons/daughters/wives in place of the father, and this transcends politics into business, cinema, sports, etc, etc. The Nehru-Gandhis (to distinguish it from the original Gandhi family), have managed to survive, even thrive, in the cut-throat and back-stabbing world on politics. And a look at their history reveals incredible luck, opportunism, and the tragic inability of a credible alternative, inside and outside the Congress. Jawaharlal Nehru was among the first to benefit from being his father's son. Motilal was already a wealthy and established barrister, and a member of the Indian National Congress. While Jawaharlal Nehru became the youngest member of the Congress Working Committee; his destiny took off when Mahatma Gandhi took him under his wing. Nehru had the right background: aristocratic, educated abroad, a Kashmiri Brahmin, erudite, and charming. His willingness to give up his riches join the mass struggle, living a life of hardship, truly endeared him to the people. He was an extremely popular leader in his own right, and as the country's first prime minister, a great statesman despite his many flaws. Yet, few in the 1940s could have imagined Nehru's descendants creating a democratic monarchy. Perhaps the most important reason is that his potential challengers all disappeared from the scene. Nehru's most feared rival, Vallabhbhai Patel, died in December 1950; earlier, Subhas Chandra Bose, a young man then, was missing, presumed dead. Mahatma Gandhi was assassinated in 1948, and in any case had never promoted his family. Thus, from the top stars of the Freedom Struggle, only Nehru survived; none of the other survivors then -- Acharya Kripalani, Abul Kalam Azad -- had Nehru's stature. He was the unchallenged leader of the unchallenged Congress in the newly independent India. Rather selfishly, Nehru asked Indira Gandhi to stay with him at his prime ministerial home and not with the man she married: Feroze Gandhi. As pointed out by Shashi Tharoor in his book India: Midnight to Millennium, it was incredibly lucky that the Parsi she married had the surname Gandhi; what if it was Daruwala? Many persons in India and abroad would often, and still do, mix up the Gandhi bit. By staying with Nehru, Indira became known in Congress circles and would gain recognition among the people of India every time she accompanied her father on his innumerable trips all over India. She even served as Congress president in 1959. Lal Bahadur Shastri, on succeeding Nehru, gave Indira a minor ministerial portfolio and kept her firmly in check. But on his untimely death within just two years, the Congress leaders -- as divided then as today -- chose Indira only because she appeared dumb and easy to control. Indira, however, was smarter. She split the Congress in 1969, nationalised banks, coined the slogan Garibi Hatao and won a landslide in 1971. 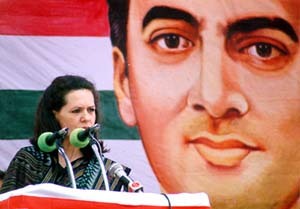 Her popularity, and of her faction of the Congress, peaked after India's decisive victory over Pakistan in the 1971 war. Indira, an insecure megalomaniac, brooked no opposition, destroyed potential rivals inside the Congress, and let her son Sanjay emerge as the rising star. In a sense, this destroyed the Congress as only sycophants and men of straw were tolerated. For example, N D Tiwari carried Sanjay's chappals, later became chief minister of Uttar Pradesh, and his re-entry into the Congress in 1997 had Sonia's backing! When the Congress lost power in 1977, the first time ever, Indira (and the Dynasty) might have faded, but the fact that the Janata Party was unable to become a cohesive unit or sustain itself helped Indira in 1980. Many people sincerely believe that India would have seen its first coalition government in 1984, because no single party seemed to enjoy the confidence of Indians in those dark days of Punjab terrorism, communal riots, and economic stagflation. But Indira's assassination gave Rajiv the largest mandate ever of over 400 seats in the Lok Sabha! The inability of the Congress to elect a new leader themselves helped the Dynasty triumph in the party, Indira's assassination helped it continue to rule India. Again, in 1991, when no one really expected any party to gain a majority, LTTE militants killed Rajiv and the sympathy factor helped the Congress became the largest party. A government was formed under P V Narasimha Rao, not the family. But with destiny still favouring the Nehru-Gandhis, the nemesis of corruption would catch up with Rao, forcing him to quit. Fearing that a destroyed Congress would end all the special privileges that Sonia and her family had become accustomed to, Rajiv's widow entered the fray. Thus, lady luck and no effective opposition, has helped the Dynasty survive. Sickeningly, many leaders in the Congress and Opposition parties too are guilty of promoting their own family members, forcing them to keep quiet on the Nehru-Gandhi dynastic perpetuation. For example, a few years ago Bal Thackeray had blasted Rajiv Gandhi's succession; today he is busy promoting his own son in the Shiv Sena, and therefore now only attacks Sonia's Italian origins. With politics becoming extremely competitive over the past few decades, most leaders rise via state-level politics, and in this sense, someone like Sonia Gandhi (and her children) has a pan-Indian appeal simply because you cannot identify her with any particular state or region. Narasimha Rao was seen very much as a southern leader, despite being a polyglot and at the Centre for years; Pawar as being from Maharashtra, Pilot as a Gujjar. Moreover, in their rise to power, many of today's leaders have tread on others's toes, who then seek to pull them down. In the Congress, Pawar's worst foes are from Maharashtra, Pranab Mukherjee's from Bengal, while Karunakaran prevented A K Antony from becoming party chief after Rao. The Dynasty has an appeal above factions, at least for now. But, there is a also lesson of history. No dynasty has ever ruled forever. No amount of charisma or name could help Rajiv destroy the Bofors scandal which clung to him. As a leader, he appeared remote and unable to comprehend the challenges facing India. Will the the present generation -- even more cutoff from India's roots -- do any better? Then, the Congress party is still struggling to come to terms with the new social forces that are throwing up new challenges and leaders. Other parties have sprouted and grown stronger. Though no non-Congress party has survived its full term, this does not mean that it will never happen. Of ourse, if Rahul and/or Priyanka prove adept leaders, the Congress and India will gain. But if they don't, voters are known to have particularly short memories. Moreover, voters had few hopes from the United Front, but expectations from Sonia Gandhi and her family are so high, it appears impossible to meet. Rajiv had the same difficulty. The higher you rise, the harder you fall. The Dynasty cannot keep expecting sympathy caused by untimely deaths or crumbling opposition as factors to help them win, nor can they keep selling nostalgia. Frankly, what we are seeing at present might well be the last flicker of brightness of the Nehru-Gandhi flame, before it finally dies down.